This one is a bit out there. Maybe the unseasonal hot weather combined with the stress of moving house went to my head. Upcycling is a fancy term for a very vintage concept. Our grandmothers made use of everything because they had to. Turning men’s old shirts into aprons (I found a pattern for this recently, stay tuned! ), altering an old dress to make it fashionable again, saving every single jar and bottle to reuse for food storage… My vintage housekeeping books are filled with ideas on how to reuse your belongings. This weekend while decluttering our apartment and preparing for the big move, I found a bunch of VHS tapes in the donate to charity pile. (Don’t get me started on how wasteful all of these old VHS tapes and CD/DVD cases are!! Not recyclable and going straight into the landfill. Ugh.) Some google searching about reusing VHS tapes turned up this chair and someone who crocheted a clutch purse from the magnetic tape. Aha. Crochet I can do. Although I couldn’t see myself carrying that purse exactly, I like the use-ribbon-as-yarn concept and decided to improvise. This is a crochet plastic bag holder made from VHS tape ribbon. It’s easy to use – just stuff the plastic bags in the top, and pull them out through the elastic in the bottom. I attached a little loop to hang over a doorknob or hook. The VHS ribbon is a bit annoying to crochet because it doesn’t glide smoothly – but it’s such an easy pattern and is really portable because all of the ribbon is contained on one reel! This is my first crochet pattern (written in American crochet terms), so please let me know if anything needs clarification. Round 1: Tie ribbon onto hair elastic. 17 sc around hair elastic. Round 3: ch2, (* dc in next stitch, ch2) , repeat from * to last stitch. Round 4: (dc, ch2) in each ch2 space around. Repeat round 4 until bag is as tall as you want. Handle: ch20, attach with a sc about 3″ further around to form handle. Fasten off. 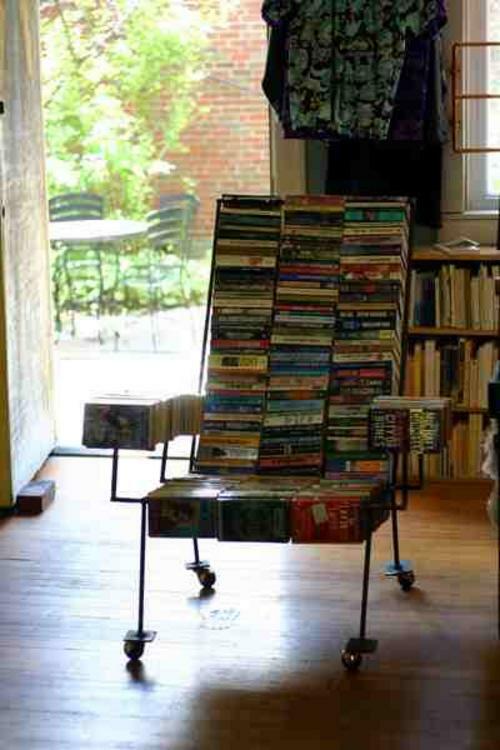 Have you done any creative upcycling projects? Let us know in the comments.